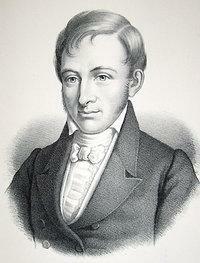 Danish linguist, from 1825 professor of history of literature at the University of Copenhagen. In the first years of his work he devoted himself to the study of the Scandinavian languages, especially Icelandic. In 1816 he went on a long study trip that led him to India. In 1823 he returned to Copenhagen. His published works, written exclusively in Danish, attracted the attention of Jakob Grimm, but they did not have a large circulation. Main works: Undersøgelse om det gamle Nordiske eller Islandske Sprogs Oprindelse (Copenhagen 1818, reprint: R. Harris, Foundations of the Indo-European Comparative Philology, 2 vol., London 1999); Den gamle Ægyptiske Tidsregning (Copenhagen 1827); Vejledning til Akra-Sproget på Kysten Ginea (Copenhagen 1828); A Grammar of the Danish language for the use of Englishmen (Copenhagen 1830). Bibliography: P. Diderichsen, Rasmus Rask und die grammatische Tradition, München 1976. Catalogus librorum, quos reliquit Erasmus Rask, Prof. quondam P. E. Linguae Orientalium et Bibliotecarius Universitatis Havniensis, Havniæ (Copenhagen), Ex officina typoghrafica Poppiana 1833, 82 p.
The sale catalogue compiled on the death of Rask lists 1773 titles organized exclusively by format: in folio (nos. 1-49), in quarto (nos. 50-447) and in ottavo (nos. 448-1778). There follows a short appendix that consists of only two titles. In the three mentioned sections the cataloguing does not respect alphabetical order: it probably repeats the order of the sale. In the page numbering there is a gap between 71 and 82, even though there are not missing pages, as the numbering of the titles is continuous. The index of the names is missing.